First off, can I just point out how awesome this name is? I mean, if I were gonna open a restaurant I would definitely call it something like The Bee's Knees just in case you wanted to know...I'm glad we got that out of the way. The Bee's Knees is a place we stumbled across during our first time exploring Augusta, GA. We were already pretty bummed because the coffee shops that we planned on checking out were all closed so there we were, wandering aimlessly and caffeine deprived when we noticed some little bee's knees down a side street. Open entering you immediately feel at home, the waitstaff consisted of mostly tattooed teens who were as friendly and energetic as can be (man I feel old writing this). The vibe was very eclectic and artsy. It had a full service bar but it was also very family friendly as well. We immediately ordered coffee to fill our empty void. 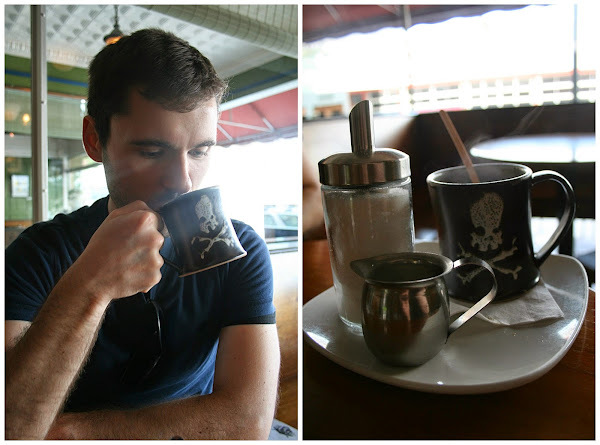 The coffee is not only sourced locally but the cup they serve it in came from a cool pottery store across the street! The menu consists of salads and soups, smaller tapas, and entree sized meals. The cuisine itself cannot be pinpointed to one culture, but instead varies from Asian, Cajun, and Mediterranean influences (among others) there are also multiple vegetarian/vegan options. The first thing we tried was the Buffalo tempeh. For those of you who aren't familiar with this ingredient, tempeh is a sort of fermented soy cake (mmmm sounds yummy doesn't it?) I ordered this for two reasons, 1 - I enjoy trying out of the ordinary things, especially of the vegetarian variety and 2 - I knew that if they somehow managed to pull this dish off, everything on on the menu was going to be delicious. Well it turns out the later statement was true, these buffalo tempeh were the bomb! Everything from the texture, to the flavoring of the sauce, the thinly sliced side of cool cucumbers and creamy Parmesan dip had me wanting more! It's very difficult to get the texture of fried tempeh to even resemble a fries chicken buffalo wing, but they certainly managed, I noticed even teenage guys were ordering (and enjoying) this appetizer which means it HAD to be good. I asked our waiter his favorite item on the menu and he undoubtedly said the quesadilla. The standard comes with monterey jack cheese, tomatoes, scallions, & jalapeno with sour cream & pineapple salsa and then it gives you the option of adding spinach, black beans OR sweet potatoes and then a protein (chicken, shrimp, or crab) for an additional charge. I ended up adding the spinach, beans, and crab (which was suggested to me). I was slightly hesitant to try the crab considering I have had it at different places before and I was very disappointed with the fishy canned version I was served. Crab is like the jewel of the sea, it has a superior flavor and texture over lobster if you ask me. I was astonished at how amazing this meal was! I mean, a queasadilla doesn't sound like an out of the ordinary meal, but dear god, the pan seared crab with a bite of pineapple salsa was out of this world! Once more this was considered a tapa, but as you can see the serving size was more than enough. What to order: Everything! But you have to try the buffalo tempeh tapa and the quesadilla! I'm gonna be honest, Augusta isn't a bad city, but they don't really have a whole lot of things to offer, however, I would drive two hours JUST to eat at The Bee's Knees again, it's THAT good. The atmosphere is fit for all ages, the food is not only good but sourced locally, and you'll find a couple of menu items you've never seen before. It's good to know that this place truly lives up to their awesome name!